I had finished at Walmart. It was a dark night a week or so ago, cold and wet, and I had come in to stretch my legs. I had bought a thing or two and was walking out. I spotted a wall, yes a whole wall, lined with Popcorn Kettles. That’s what they were called. Displayed one on top of another, 100 of them, I’d say. About the size of a kitchen bucket with a tight lid. Beautiful shiny cans, imprinted with scenes of Santa and elves and red bows and “Merry Christmas.” Beautiful. Just $5. Quite a bargain. I went up close. Curious. Were they empty, intended for popcorn? Probably not. The lids were transparent. I could see in. Inside were small bags of popcorn, stuffed. Cheddar cheese, caramel, butter. I love popcorn, but just the plain kind. I enjoy popping it. I stood there, marveling. I was struck by the ingenuity. Was this the idea of whoever made the cans? Or the popcorn maker? And how could Walmart make a penny on this deal…considering not only the kettles and the popcorn and the fancy Christmas motifs but the packing and transport here and the very work of assembling this big display, on and on. I’m familiar with the idea of a loss leader in retail. But still. This had to be a super loss leader. I protested but she insisted. I was so surprised, in fact astonished, and she saw that. “Ernesta!” Well, I think that’s what she said. What else could I say? She was brimming with Christmas spirit. She was doing this act of charity for a very old man that she assumed was tempted by the wonderful $5 popcorn bargain but had finally decided not to splurge. Well, that’s how I saw it. 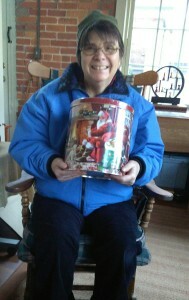 For sure declining her gift would have spoiled her marvelous Christmas spirit. She was glowing. She turned and walked away. Paused for a minute in the rain, turned around, gave me a big wave. Well, she did far more than give me a nice gift. Sure, I saw Christmas was coming up, just as for her. But I’ve seen many Christmases come and go. Some of the fun and excitement and anticipation have slipped away. The law of declining marginal satisfaction, an economist might say. Which is normal. She still possessed it full and vibrant. Yes, it was indeed a dismal night but I drove home with a special glow in me. This new glow was this remarkable lady’s real Christmas gift to me. This reminder of what Christmas is really about. This great message of love and generosity. Later I wondered what to do with the kettle corn. I did not want it for myself. I got an idea. Liz and her kettle of popcorn. Beaming! In the spirit of Christmas, she’ll be sharing it, too, I’m sure. strange handicap. Lives alone in a tiny condo close by. No, not alone, Has a cute little dog….11 years old…hers these many years. She takes her darling pet with her everywhere. Some days she dresses it in a pink sweater, sometimes a blue one. Yes, she has a loving dad and sister, maybe other relatives, too, but her precious pet is her constant companion. I see Liz walk by nearly every day. I kept my popcorn kettle handy. She did come by, I invited her in, we had a chat, and I put Ernesta’s gift in her hands. She lit up. She was delighted. And so was I. I was just passing on the loving spirit that Ernesta had blessed me with. And I’m still feeling it as I pass this little story on to you. Merry Christmas, one and all! And Happy New Year 2017! Oh, I’m in Morro Bay, CA now. Have been here 72 hours. My usual winter away from the cold of Deep River. No snow, of course, but rainy and snappy. You’ll be hearing from me….